Greater efficiency in civil dispute resolution is very much dependent on organized but fair fact-finding. Under European law, however, no clear-cut categorization of means of evidence exists as yet, and significantly diverging interpretations persist of what is considered ‘evidence’ in the sense of the foundational Council Regulation (EC) No. 1206/2001 (EER). The EER fails to provide comprehensive rules for many other aspects of evidence taking, pointing instead to national legislation for solutions. As long as evidentiary rules remain different from country to country, there is an inherent risk of conflict of laws between different systems in the course of cooperation between courts in cross-border matters, leading to mistrust amongst judiciary and other participants in the proceedings. Focusing on national rules, and using a comparative method which takes into consideration legal experiences from all legal circles in the EU, this book explains and analyses how the law of evidence works in Europe today. The authors draw on the vast base of relevant information collected in twenty-seven Member States by national reporters. Following the classical enumeration of types of evidence – production of documents, examination of witnesses, expert evidence, inspection by the judge, and examination of the parties – chapters encompass such issues and topics as the following. instances in which a court can refuse a request for evidence. The authors offer well-grounded recommendations on requested judge’s entitlements, direct and convenient communication, cost issues, revised provisions concerning language obstacles, unification of presumptions, and much more. Armed with the wide-ranging knowledge presented here, practitioners handling civil cases anywhere in Europe will derive great practical benefit from this book. As a masterful synthesis of how evidence is used in national courts in EU Member States, and of how that use is changing, the book will be greatly valued as a unique resource by legal scholars and academics. With featured recommendations it can contribute to the development of mutual trust among the national courts inside the EU as well as trust among policymakers and national courts. "This publication has been produced with the financial support of the 2007-2013 Civil Justice Programme of the European Union. The contents of this publication are the sole responsibility of authors and can in no way be taken to reflect the views of the European Commission." CHAPTER 1 Evidence Law in an International Context: The Principles of Transnational Civil Procedure C.H. van Rhee. CHAPTER 2 Evidence in European Civil Procedure Robert Turner. CHAPTER 3 Fundamental Principles of Taking Evidence in Civil Procedure. CHAPTER 3A The Right to Be Heard in the Taking of Evidence Lojze Ude & Matija Damjan. CHAPTER 3B The Principles of Oral and Written Presentation Walter H. Rechberger. CHAPTER 3C Direct Evidence and the Review of the Trial Court’s Findings of Fact by an Appellate Court: The Austrian Example Wolfgang Jelinek. CHAPTER 3D Assessment of Evidence Jorg Sladič & Alan Uzelac. CHAPTER 3E The Judge’s Case Management Powers regarding Evidence Christian Wolf & Nicola Zeibig. CHAPTER 4 Means of Proof 149. CHAPTER 4A Witness Testimony Darius Bolzanas & Egidija Tamošiūnienė . CHAPTER 4B Experts Stefaan Voet. CHAPTER 5 Inadmissible Evidence: Illegally Obtained Evidence and the Limits of the Judicial Establishment of the Truth Bettina Nunner-Krautgasser & Philipp Anzenberger. CHAPTER 6A Legal Costs: An Obstacle for Effective Dispute Resolution in Europe? Riikka Koulu. 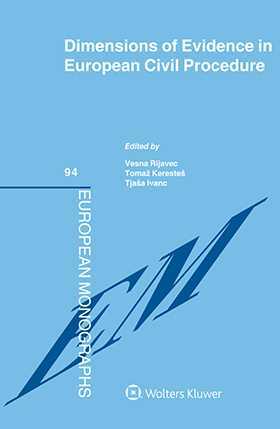 CHAPTER 6B Language Obstacles in the Search for Effective and Fair Fact-Finding Katja Drnovšek. CHAPTER 6C Theoretical Background of Using Information Technology in Evidence Taking Tjaša Ivanc. CHAPTER 6D Prevention from Destruction of Relevant Evidence in Cross-Border Cases Noémia Bessa Vilela & Marco Ribeiro Henriques. CHAPTER 7 Common Core After All? Tomaž Keresteš & José Caramelo Gomes . CHAPTER 8 Assessment of Evidence Regulation Vesna Rijavec & Aleš Galič . APPENDIX Cross-Border Taking of Evidence: European Case Studies. Table of Legal Sources: EU.